A few days ago, the timetable was released to us common folk. It seems that they tried to intersperse the rock acts in amongst the non-rock acts instead of clumping them all together. So… no matter what time you go, there’ll be a smorgasbord of musics to sample and taste. I’ll make an english timetable at the end of this post for all you non-hangeul-reading mofos. By the by – weather report is lookin’ real nice. Lee Han Cheol – Don’t know too much about him except that he is from the old guard of Korean pop rock. He’s had radio play throughout the years since his 1994 debut and has done all the TV shows. He headlined every single Sunset Live that I’ve been to so at this point he’s just part of the landscape for me. Another band my wife will love. Human Race – I’ve seen these guys a few times this summer at various festivals. Apparently, they had a hit on one of the Top Band TV shows and now all the kids go nuts for them. A very tight sounding band… I can’t tell if their single sounds familiar because I’ve heard it before or because it sounds like some other band from back home. Bard – Another purely unique Korean act that you can predictably see at Sunset each year. These folks play traditional celtic music. It’s perfect for just lying down in the sun and enjoying life. Great songwriting and superb talent. Unchained – These boys are some of the hardest working bands in busan right now. They began as an Alice in Chains cover band but have quickly branched out to writing their own AiC inspired original music. Very fun to watch and get into with the crowd. This is a must-see band within the Busan music scene. They recently released a new music video featuring the singer from 21 Scott. One Drop East – I’m quite partial to these guys… after all (full disclosure), it is, in fact, the band I play in. So I won’t toot our own horn section too much… just suffice to say this is a show we look forward to playing every year. Tehiun & Purijah – I’m very excited to see these guys. I’ve seen the lead singer, Tehiun, once before in a solo, acoustic show and he was amazing. These boys are newish on the reggae scene, but they’ve made up for lost time. Tehiun runs his own record label and his own indie music magazine in addition to writing songs for and leading Purijah. The songs themselves are infective and easy to sing a long to, even if Korean isn’t your first language! Ninano Nanda – Another bizarre act on paper that works miraculously in action. 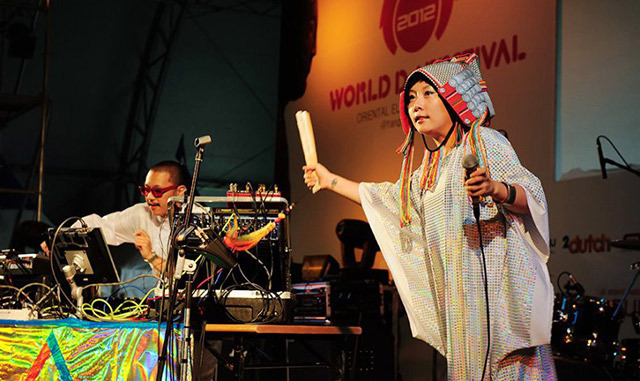 Ninano Nanda are a duo – he lays down funky house and dub beats, she sings ethereal pansori (Korean folk singing) over the top. Just fantastic. A truly Korean experience. Don’t miss these two! Seoul Riddim Superclub – They are a late addition to the Sunset lineup, but extremely welcome. They are the reggae supergroup composed of 13 members from Kingston Rudieska, Tehiun and Purijah with MC’s Jahmai and Rude Paper. Since they are such a large group spanning multiple bands, it is rare for them to put on a live show. This will be a special performance for everyone, both on stage and in front of it. Hot Pepper Pasta – This band represents the finest jazz talent Busan has to offer. But you won’t find them playing along to grampy’s old records. Hot Pepper Pasta turn up the volume with blistering horn lines, the deepest funk grooves and horn solos that make you scream. If you miss them here, you can find them most Saturday nights at Billie Jean in Haeundae… or you could catch them both places! Cozy Cafe – I don’t know much about this band… but from what I’ve seen on youtube they look like a great jazzy pop group. Cute and capable singer, talented band. Can’t ask for much more. So there you have it… every damn band of the weekend. A whole lot of winners in there too. It isn’t too late to pre-order tickets (details in part 2) or you can just buy a wrist band on the day. See you at Sunset Live!!! 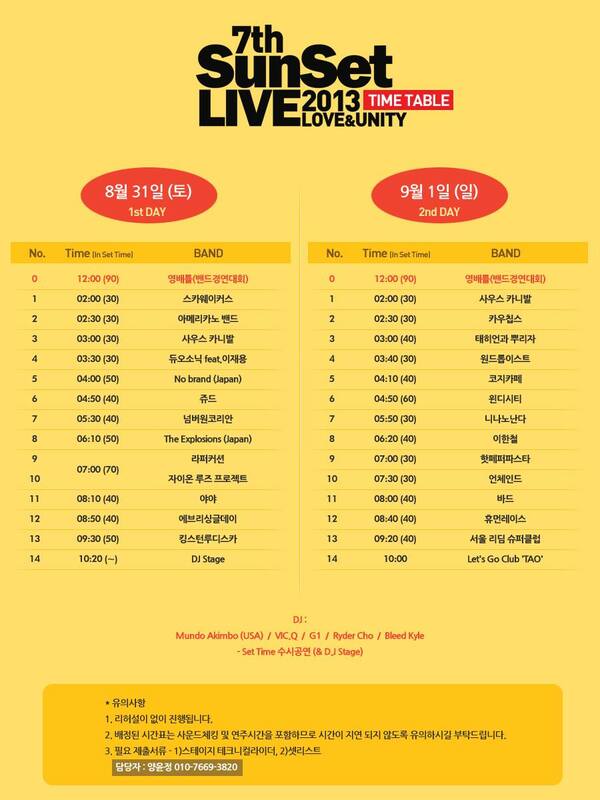 This entry was posted in Show and tagged Arts and Entertainment, Bands and Artists, Bard, Busan, Cowchips, Cozy Cafe, culture, Duo Sonic, Festival, Hot Pepper Pasta, Human Race, 이한철, Kingston Rudieska, Korea, lee han cheol, music, Ninano Nanda, One Drop East, Purijah, Reggae, Rock, Rude Paper, Seoul Riddim Superclub, Tehiun, Unchained, Windy City on August 27, 2013 by Brian Kilrain.